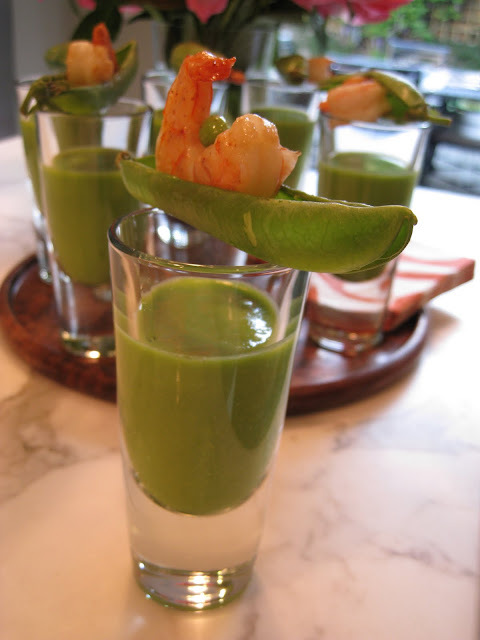 On a hot day like today, a nice refreshing chilled pea soup shot seemed like just the right way to go. Bring to boil in a large saucepan a mixture of equal parts chicken stock and water, about 6 cups total. Cook peas for 2-3 minutes, or until tender. Drain reserving approximately 2 cups of the liquid. Rinse peas under cold water. Let cooking liquid cool a bit. Working in 2 batches, puree half the peas with 1 cup of the liquid and a pinch of salt and pepper. Adjust the salt to your preference. Strain through a fine sieve and repeat. Place the soup into a container and chill. Remove from the refrigerator about half an hour before serving so it is not ice cold, but just chilled. Melt butter and toss with shrimp. Place shrimp in a small baking sheet and broil for about 1 minute per side or until cooked. Place each shrimp in one of the pea shells and carefully lay on top of each small glass of soup.